The best books have a way of tearing us apart and piecing us back together again. The very best books render us, after such piecing together, forever a bit changed. Little Fires Everywhere is one of those very best books. The setting: 1990s Shaker Heights, a picture-perfect suburbia that, with the help of its picture-perfect residents, adheres to the rules. Enter Mia and Pearl Warren, a mother-daughter duo with a mysterious past and personalities that spark the curiosities and obsessions of everyone they meet, especially those of the large, well-connected, wealthy Richardson clan. When Shaker Heights is met with a crisis involving the adoption of a Chinese baby, tensions arise and the town becomes split. Enter class conflict. Enter well-meaning white people with poor execution. Enter racial bias. Enter troubled teens. Enter art. Enter the complexities and terrors and wonders of motherhood. Enter running away and never looking back. In her intricate, sprawling, visceral prose, Celeste Ng has created here a book for the ages. This is a must-read. People, The Washington Post, Bustle, Esquire, Southern Living, The Daily Beast, GQ, Entertainment Weekly, NPR, Amazon, Barnes & Noble, iBooks, Audible, Goodreads, Library Reads, Book of the Month, Paste, Kirkus Reviews, St. Louis Post-Dispatch, and many more! From the bestselling author of Everything I Never Told You, a riveting novel that traces the intertwined fates of the picture-perfect Richardson family and the enigmatic mother and daughter who upend their lives. In Shaker Heights, a placid, progressive suburb of Cleveland, everything is planned – from the layout of the winding roads, to the colors of the houses, to the successful lives its residents will go on to lead. And no one embodies this spirit more than Elena Richardson, whose guiding principle is playing by the rules. Enter Mia Warren – an enigmatic artist and single mother – who arrives in this idyllic bubble with her teenaged daughter Pearl, and rents a house from the Richardsons. Soon Mia and Pearl become more than tenants: all four Richardson children are drawn to the mother-daughter pair. But Mia carries with her a mysterious past and a disregard for the status quo that threatens to upend this carefully ordered community. When old family friends of the Richardsons attempt to adopt a Chinese-American baby, a custody battle erupts that dramatically divides the town--and puts Mia and Elena on opposing sides. Suspicious of Mia and her motives, Elena is determined to uncover the secrets in Mia's past. But her obsession will come at unexpected and devastating costs. Little Fires Everywhere explores the weight of secrets, the nature of art and identity, and the ferocious pull of motherhood – and the danger of believing that following the rules can avert disaster. Perfect for book clubs! Visit celesteng.com for discussion guides and more. Celeste Ng grew up in Pittsburgh, Pennsylvania, and Shaker Heights, Ohio. She graduated from Harvard University and earned an MFA from the University of Michigan. Her debut novel, Everything I Never Told You, was a New York Times bestseller and winner of the Massachusetts Book Award, the Asian/Pacific American Award for Literature, and the ALA's Alex Award. 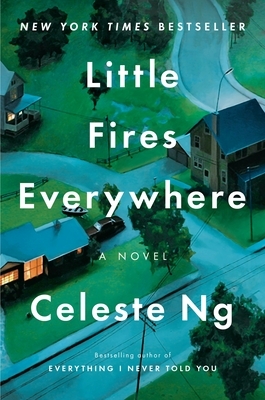 Little Fires Everywhere, Ng's second novel, was a New York Times bestseller, winner of the Ohioana Book Award, and named a best book of the year by over twenty-five publications. Her books have been translated into more than thirty languages and she was the recipient of a fellowship from the National Endowment for the Arts. She lives in Cambridge, Massachusetts.